As someone who doesn’t have food allergies, I always struggle a little when I have to cook for someone who does. It’s not because I can’t do it – it’s because I always want to make something that everyone will like. This cake is beautiful, perfect for Thanksgiving – and gluten free. 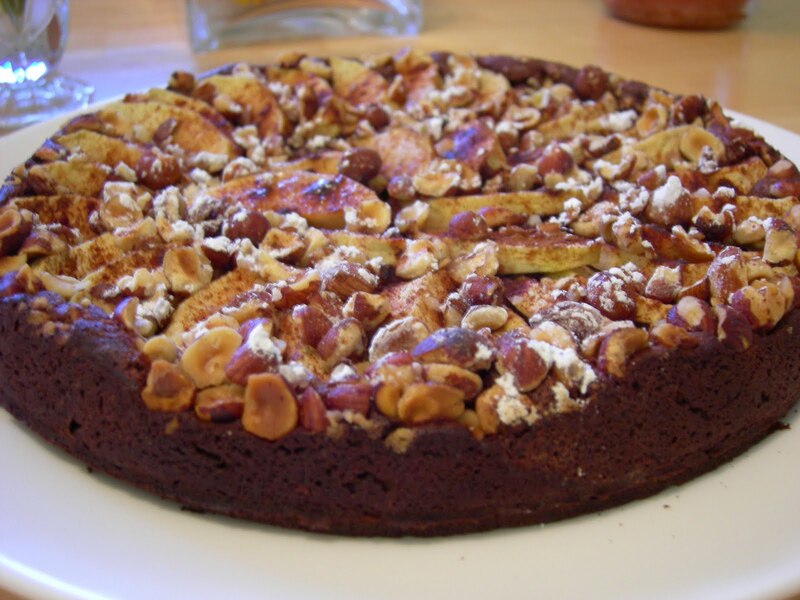 This is rich and chocolatey, which makes it an awesome dessert even for those who aren’t on a gluten-free diet and the apples and hazelnuts make it perfect for the season. It’s a little more involved than a normal cake, but it’s not very hard and totally worth the extra effort! Prepare an 8-inch or 9-inch springform pan. Use nonstick spray or softened butter to great the bottom and sides of the springform pan. Peel, corn, and slice the apples into ½-inch pieces and set aside. In a small saucepan, bring the heavy cream to a boil. Pour the heavy cream over the chopped chocolate and let cool for about a minute. Mix thoroughly to make a smooth ganache. Using a rubber spatula, slowly mix in the egg yolks and cornstarch, until thoroughly incorporated. The mixture should be smooth and slightly thick. In a separate bowl, add the honey to the egg whites, and whip to soft peaks. Using a whisk, add about 1/3 of the whipped egg whites to the chocolate mixture to lighten. Using a rubber spatula, gently fold in the remaining whipped egg whites in two batches, taking care to avoid over-mixing. White streaks of egg white should still be visible in the chocolate. Deposit the batter into the greased springform pan. Top with the chopped apples and hazelnuts, then dust lightly with confectioner’s sugar and ground cinnamon. Place the springform pan on a cookie sheet, or sheet pan, and bake immediately for 25 to 35 minutes or until a toothpick inserted to the middle of the cake comes out clean. Let the cake cool in the springform pan for at least 15 minutes before unmolding.